There is currently just the 1 ferry route running between Turkey and Lesbos operated by 1 ferry company – Turyol. The Ayvalik to Mytilene ferry crossing operates weekly with a scheduled sailing duration from about 1 hour 30 minutes. Whilst we’ve taken great care to ensure the information on this page is correct, as the frequency and duration of crossings on all routes can vary from time to time we’d advise that you get a live quote for current availability on this Turkey Lesbos crossing between Ayvalik and Mytilene. Turkey is a country bordering both Southeast Europe and Western Asia, with coastlines facing the Black Sea to the north, Mediterranean to the south and the Aegean to the west. Given its location between the two continents, Turkey has long been admired for its diverse cultural heritage, helping it become one of the most visited countries in the world. Examples of the country’s exciting history are commonplace, most notably in the majestic mosques of Istanbul and the captivating ruins of Ephesus. Its natural scenery varies enormously, too, from sandy beaches on the west coast to massive mountains in the east, offering a wide range of outdoor activities if you want to escape the bustling bazaars in the cities. Turkey has a number of ports along its coast and, due to the amount of islands in the Aegean and Mediterranean Seas, it offers numerous ferry crossings to a wide range of international destinations, as well as domestic routes from Istanbul across the Sea of Marmara. As the third largest island in Greece, Lesbos covers an area of over sixteen hundred square kilometres in the north-eastern Aegean Sea. You won’t come across many tourist resorts on Lesbos, but what you will find are roughly eleven million olive trees, copious sandy beaches, lively port towns and an authentic Greek lifestyle. Add to that list a petrified forest, fossilized around twenty million years ago, and you have one of the country’s most extraordinary islands. Commonly sighted are almost three hundred bird species, which are best admired along one of the many hiking trails and cycling routes, or when relaxing in therapeutic hot springs, flowing with some of the warmest mineral waters on the continent. 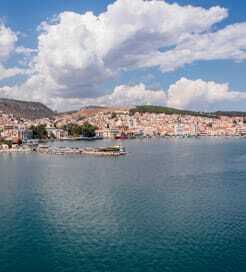 Greece has one of the largest ferry networks in Europe, owing to the sheer quantity of islands and archipelagos. Lesbos is served by many routes from around the Aegean, including a few cities on the mainland and the surrounding islands.